Cinque terre hike from Levanto to Monterosso, along one of the most beautiful hiking trails of the Cinque Terre National Park, offering breathtaking sceneries over the sea and the villages. Meet your local guide at the Levanto train station. Hike along a beautiful path immersed in the typical Mediterranean vegetation with stunning sceneries over the sea. Visit the Podere Case Lovara to learn about this ambitious project of restoration of the farm and the traditional agriculture in a stunning setting among olive groves, vineyards and vegetable gardens with a view, immersed in the Cinque Terre National Park. We continue the path, running along the ridge among the ruins of the ancient St. Anthony’s convent, with spectacular views over the five renowned villages. 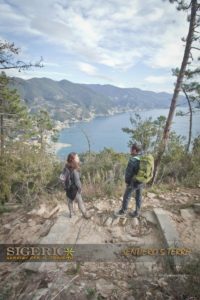 We walk downhill as far as one of the Cinque Terre, Monterosso. Guided walk and free time for lunch, explore or a dip in the clear water of Fegina beach. Difficulty: E (medium-easy). It’s necessaru to wear hiking shoes and clothing suitable for walking. Price (min 8 max 15 people): 25 euro per person for English speaking tour guide + 10 euro per person for tasting, to be paid on site.